Léo Ayotte was born in a family of modest means, he began his studies at the College Séraphique and at Trois-Rivières Seminary, and finally, in Nicolet. He abandoned his studies at the end of his rhetoric and began to compose poems and paint. Through his art career and lectures, Ayott was able to save enough money to fulfil his dream of visiting France. In July 1962, he went to visit the Louvre Museum, which moved him to tears. He visited his friend François Hertel and Robert Roussil, a sculptor, and the painter Jean Dallaire. He ended his trip on the French Riviera where he spent a lot of time painting with his niece, Louise-Helene Ayotte, who has just been awarded the Consul of France at the Ecole des Beaux-Arts. After a year in France, he returned to Canada, where he participated in numerous exhibitions throughout Quebec until 1975. Suffering from cancer, he was transported on December 18, 1976 to the Hospital of Saint-Hyacinthe where he died three days later on December 21, 1976. 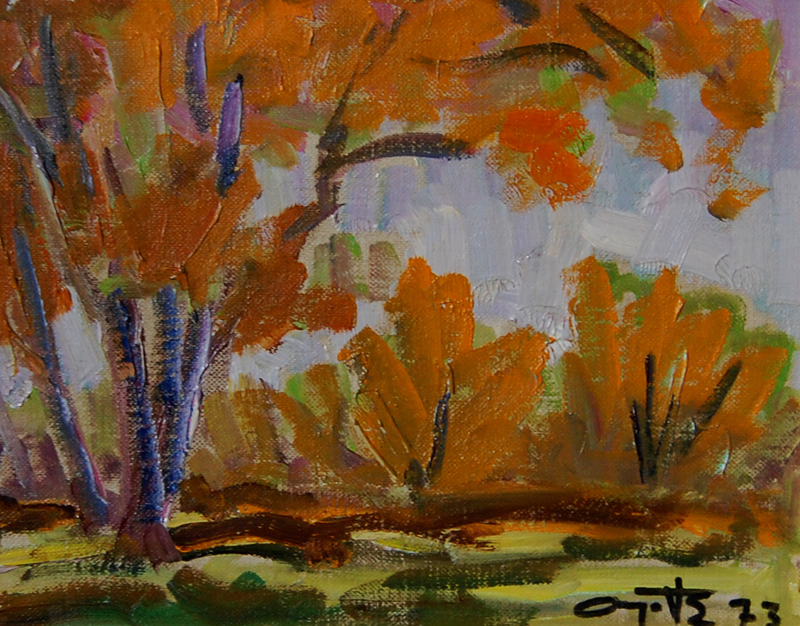 Ayotte began writing and doing landscape sketches at an early age. 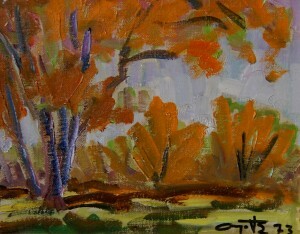 His love of nature brought him to painting. Mostly self-taught, he had a unique style. Ayotte often used a single brush to achieve a work. From a single stroke and with spontaneity Ayotte always achieved a successful painting with his first attempt, never having to make corrections or touch-ups.Except for his portraits, he painted without preliminary drawings, taking the time to make observations before starting to paint. The bold and lively colors that emerged from his brush captured the essence of his subjects. His colorful landscapes are real hymns to nature. His still lifes and portraits, charged with emotion, led him to be considered a major artist in Quebec. This entry was posted in Ayotte Léo, Biographies and tagged Ayotte, galerie michel-ange, galerie valentin, Léo Ayotte by chocolat. Bookmark the permalink. All reproduction of the artwork is strictly prohibited without written permission of the authors.